Creative and cutting edge, audio speaker designs are not only becoming more unconventional but they’re also leading to more possibilities when placed in our homes, including as artistic centre pieces and for providing high quality home cinema systems. 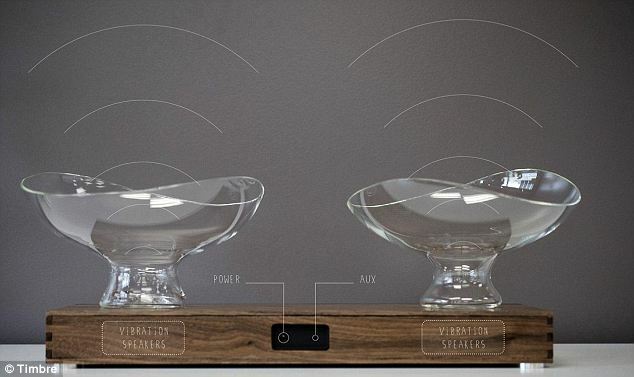 One of the most unusual designs of modern audio speaker include Timbre speakers, which uses electronics within a wooden box to transfer sound to two glass bowls. Created by New Zealand designer Casey Lin, the bowls can be moved around to change and pitch of whatever’s being played, acting as a powerful speaker as well as a decorative feature that can be used with an iPhone or other alternative mp3 player. Another speaker feature which could soon be enhancing homes come from GoldenEar Technology, who have become reputable for their brand of advanced ceiling speakers. Producing THX-quality sound, the speakers are built into the walls and form a perfect solution for those who don’t have the space for large speakers, but want to create that cinema experience in their living rooms. At the CEDIA Expo conference last month in Colorado, which attracted nearly 18,000 visitors from 84 countries, speaker designers took the opportunity to showcase their talents by placing subwoofers and other devices in a variety of unusual locations, such as beer barrels, rocks and even wallpaper. A popular feature at the Expo was the combination of speakers with art, using artistic designs and methods to create ‘speaker art’ to place on walls within homes. The Expo was also where Core Brands showcased their new Protégé series of built in ceiling speakers and subwoofers for walls, allowing them to blend in better with their surroundings for the benefit of both homeowners and interior designers. To find out more about the latest designs and state-of-the-art technology featured in modern audio speakers, why not visit your local high street electrical store and ask about the range of modern speakers currently available to purchase, as you’ll be sure to find one perfect for updating your home or for Christmas presents for friends and family who love their music.